Have the "Slime of your life." It is a phrase you will hear over and over from the moment you step through the front lobby door of the Nickelodeon Suites Resort in Orlando. What you don't realize, is that no phrase has ever been more true to form. You and your family will not be able to help but to have the time of your lives at this fun-filled hotel. With two water park pools, a mall area packed with fun activities and fun themed rooms, the Nick Hotel is not just a resort, it is a vacation destination in itself! Check in to the resort is quick and easy. The front desk agent was very informative and the customer service level was great. We were given a sheet that had the resort activities for the week on it as well as the special programs and restaurant information on it. I asked several questions and she was able to answer them all. We were given arm bands that are required to be worn during your stay and room keys. I want to add a quick mention about the room keys. I loved them! You just wave them in front of the door and they unlock it. So much easier than the ones you actually have to stick in or slide. 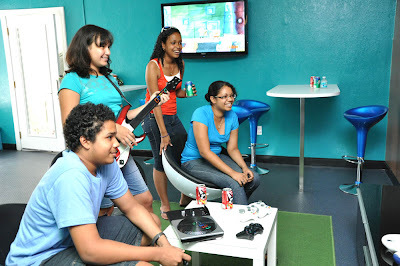 The lobby is clean, cool and screams fun as soon as you walk in. We were in building 8 on the top floor, which is directly above the main pool and water park. It was hard to get the boys to actually walk to the room as they were so distracted by the awesomeness of the pool area. I finally managed to get them to pick their jaws up off the floor and head into the room though. We were in a two bedroom themed KidSuite room and it was plenty big enough for our family of six! As you walk in, there is a sitting area with a chair, pull-out sofa, large flat screen tv, small dining area, and a kitchenette complete with sink, fridge and microwave. There was also a special surprise awaiting us. The hotel was kind enough to have a Spongebob themed gift basket and balloons waiting for Josh and gifts for each of the other boys as well. A great surprise and just a few of the customized touches that you can also order as part of their Birthday Celebrations at the Nick Hotel. Off the kitchenette is the bathroom, which had plenty of towels and was standard for a hotel room. As we turned the corner, we were met with a colorful mural of "The Fairy Odd Parents." This mural is really well done, takes up the whole wall and leads into a full wall mural within the kid's room. The boys really got a kick out of the theming and it set the tone for a stay full of fun. There are a set of bunk beds, shelves and a TV in the kid's room as well. The last part of the two bedroom KidSuite was the private master bedroom. Did I say private? Yep, I sure did. It had a door! I am a huge fan of private master bedrooms in hotel suites like this. Some hotels just leave the area open, but it makes a big difference to be able to shut that door and get some grown up alone time. The master bedroom had a comfy bed, large closet, TV and small desk area. 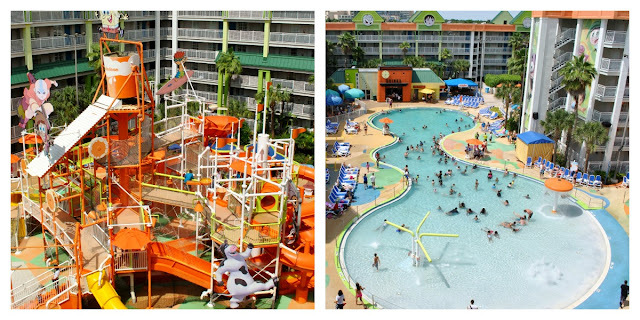 The water park at the Nickelodeon Suites Resort is probably the main reason families decide to stay here, and for good reason! There are actually two pools. 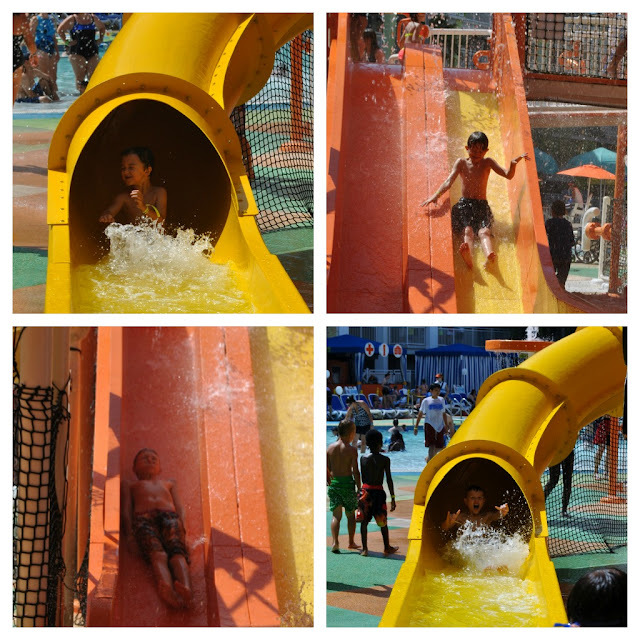 The Oasis pool is an Olympic style pool, with an interactive water tower that has a few slides for both larger and smaller children as well as a splash zone for preschoolers. This pool opens later in the morning and closes earlier in the evening, but it is just a short walk over to the Lagoon Pool. The Lagoon Pool is the creme de la creme of resort pool areas. It features a huge tower that contains 7 water slides, water guns, climbing nets and a 400 gallon dump tank that douses guests in water periodically and green slime at two scheduled periods throughout the day. There is a poolside craft area here where scheduled activities are held, cabanas for rent and plenty of great quality beach chairs available. The zero entry pool is perfect for smaller children and there is a splash zone for smaller children as well as a basketball court. All I can say is do not miss the mass sliming. The anticipation leading up to it is great and it is loads of fun to watch. My oldest even gathered a cup of slime to pour all over mommy. Guess he wanted to make sure I didn't miss out on the fun! There is a 3,000 sq. foot arcade that the boys had a blast playing in. 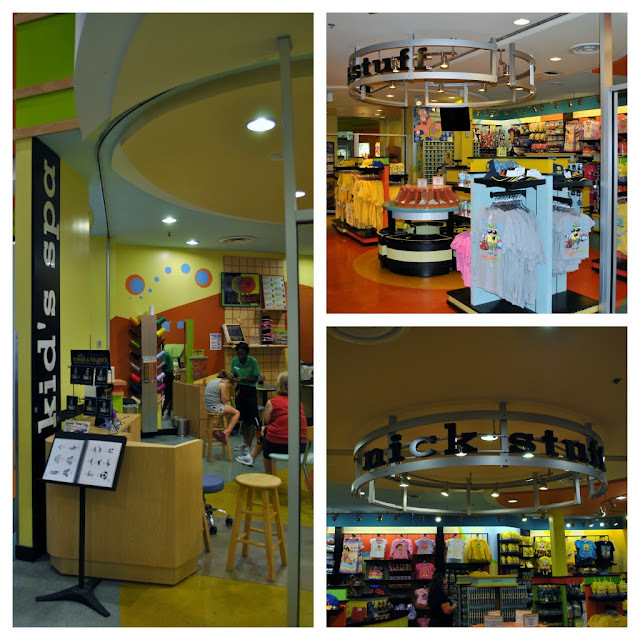 There are two shops full of Nickelodeon themed merchandise as well as essentials that you may have forgotten. The Kids' Spa is a fun place for girls to visit, although they do offer things like tattoos for boys too. Services at the kid's spa range from $10-$40 and packages are available also. The 4-D theater is open most the day and evening, featuring thrilling shows that are sure to engage all your senses. Prices are reasonable and there is an unlimited armband that can be purchased, which is perfect for those rainy days. Studio Nick is across from the 4-D theater and offers your family a chance to get in on all the live action fun of real Nick shows. The last night we were here, we were able to watch a Double Dare Live show. I can still remember watching this on TV when I was younger and it was just as much fun to watch the families get messy and splattered in slime in person. Different shows are shown throughout the week and casting for some of the shows like Double Dare Live take place earlier in the day if you want the chance to get on stage! There are two options for parents to get some alone time and kids to have fun on their own at night. 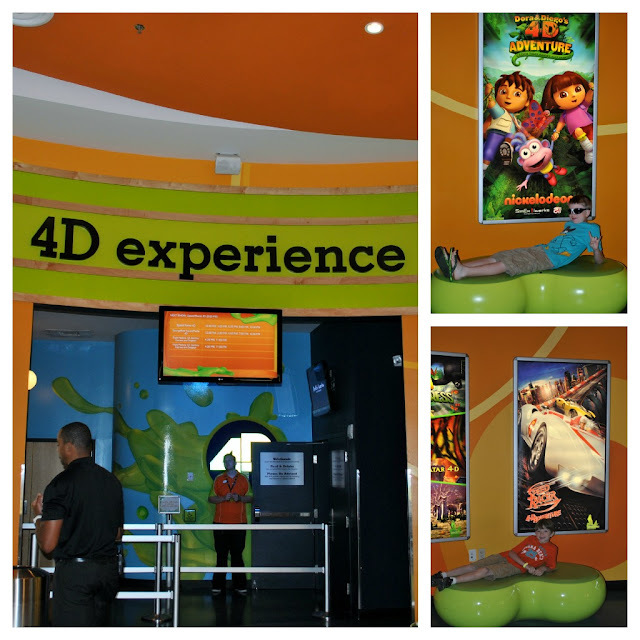 The first is the Kids Night Out option for kids ages 5-12. They can enjoy a night of supervised fun for $40 and parents can get a break. 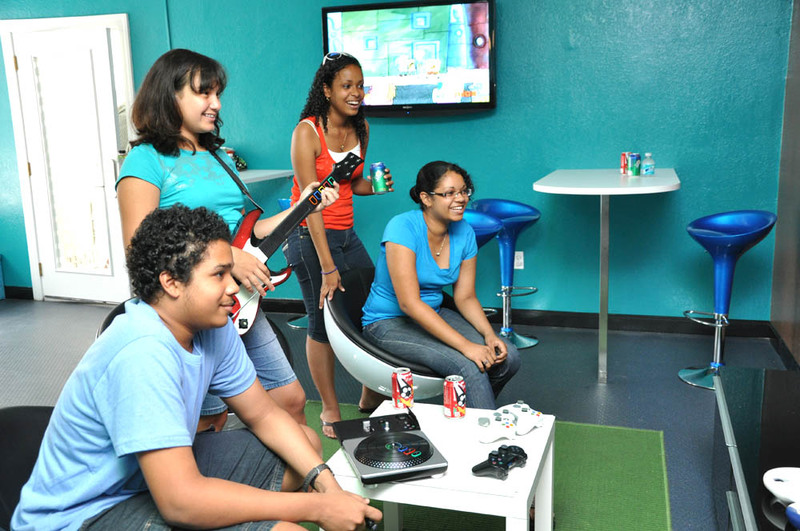 The other is the Code 9 Teen Lounge, where teens ages 13-17 can hang out, play video games and grab some pizza while making new friends. This is only $12 a night and a great value with dinner included! If you never want to leave the Nick Hotel, you won't have to go far to find delicious food options. 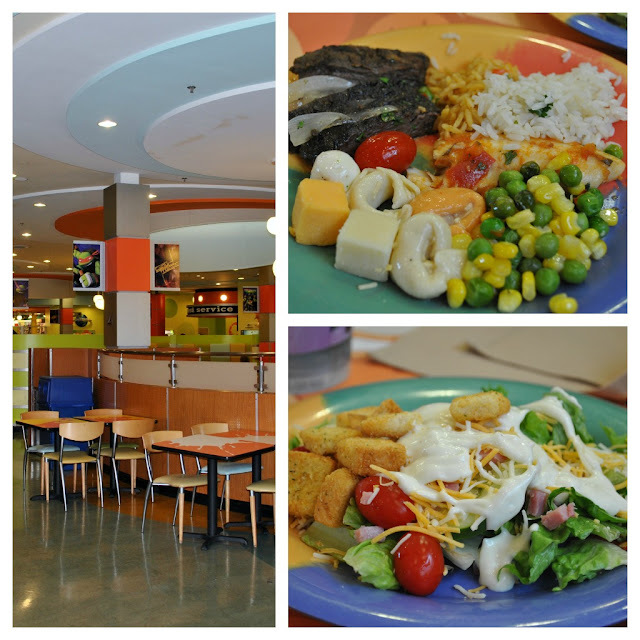 The Nicktoons Cafe offers menu options as well as a buffet throughout the day. We had dinner here off the buffet our first night and everything was tasty, especially the skirt steak. There are plenty of kid friendly options too and tons of dessert! The Nicktoons Cafe also offers the daily character breakfast, which we attended on our second morning there. 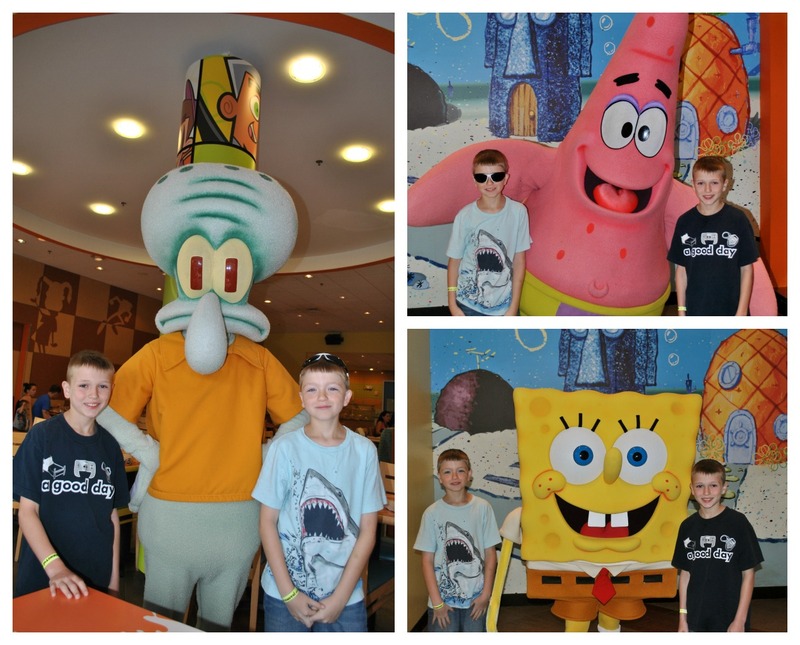 The boys liked meeting the Spongebob characters. Well, all of them except my 8 year old who is deathly afraid of all characters. They were all good about not getting to close to him though and the buffet had plenty of options from fresh fruit to waffles. On select nights, you will also find a dinner buffet complete with the Nick Hotel's newest characters, the Teenage Mutant Ninja Turtles. In addition to the Nicktoons Cafe, there is also a mall buffet option in the mornings for breakfast, a food court area with Subway, pizza and a grill area that serves burgers and fries. There is a Starbucks for those who need a coffee fix and I would highly suggest the massive brownies and cookies they sell there. Talk about delicious! 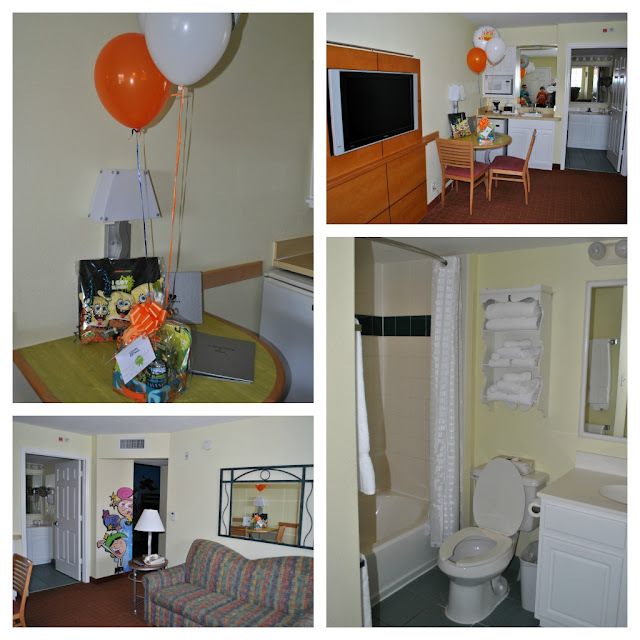 As mentioned earlier, there are tons of ways to make birthdays special at the Nickelodeon Suites Resort. From special gift baskets that can be delivered on arrival to entire Birthday Party packages. One of the best things was the birthday button they gave Joshua to wear when we arrived. He was constantly having "Happy Birthday" shouted at him by staff members and was even serenaded by one particularly hilarious guy. The customer service here is outstanding. We asked for a few extra pillows and they were delivered almost immediately. The second night, there was a problem with our air not cooling the room and someone came out at 10pm and had it fixed within literally 10 minutes! One thing I will mention is that there was only a single elevator convenient to our building and room and it sometimes could take quite a while to come to the top floor where we were. Definitely not something to keep us from having an amazing time, but something worth mentioning for those planning to ask for a top floor. Really, you cannot go wrong with a stay at the Nick Hotel in Orlando. The fun is endless, the service is top notch and the rooms are comfy as well. A great value for the price and comparable to some other hotels in the area that may offer no entertainment for the whole family. 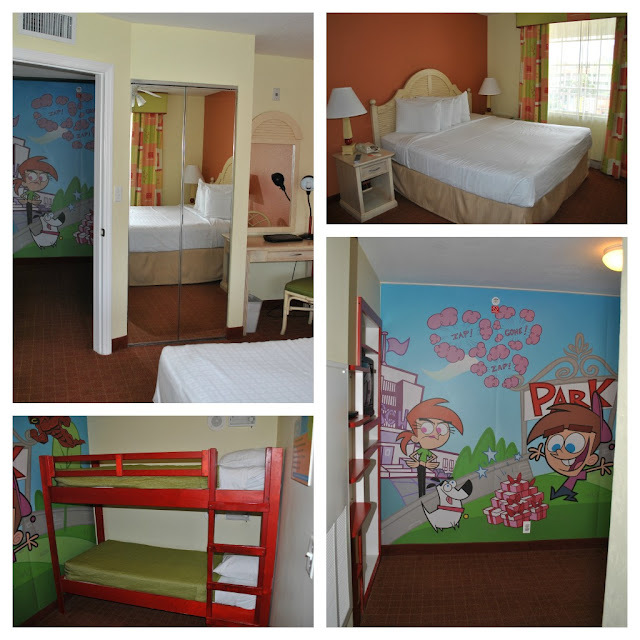 You can check out the Nickelodeon Suites Resort website for more information on pricing and special summer packaging. My daughter LOVES the Nick hotel.. The slime was the highlight. The rooms could have been a little comfier for adults though. Really Stefanie, what did you all not like about the rooms? The only think I would have wished is that the chair reclined, but the best was super cozy. I think the slime would be the best part! And renting a cabana would be a good idea, I think. I wanna go!!! Looks like a fun place to stay! We have gone once. I'm hoping to go again. Looks like you had a blast. I so want to go here! This looks like a dream come true for kids! We are planning on going to Florida this Summer so hopefully we can go to the Nick Hotel!! Thanks for letting us know about it. My kids are bigger Nick fans then Disney fans. We've always wanted to visit this place! This looks like a blast for kids. My children would love to stay here! What FUN! I had not idea that there was a Nick hotel! So fun!!!! My kids had a total package of fun on Visiting theme parks, they where Nick and Disney fanatics. My kids woudl never want to leave the waterpark area LOL. Looks like such a fun place to stay. I'm in Kissimmee now, I need to run over to the Nick hotel and check it out! That slide looks intense - woo wee - but fun! Love it! Kathleen -- Mainly, I thought the beds were really uncomfortable -- very hard. We had the same room, but with Spongebob, maybe yours was refurbished. My daughter loved everything about the hotel though! This looks like SO much FUN!!!!! Wow! How fun is this! My kids would love it there. This looks like every child's dream vacation!! Slime!! So fun!! Wow, what a great vacation! I have GOT to tell my hubby about this- also, I have two grandsons and a granddaughter- I think they would love to go there next summer! Oh would my grandson love this place. Spongebob is his favorite and has been for a couple years now. The hotel looked like a small apartment...nice! This looks like a ton of fun! I would love to go here with my family. Sounds like a vacation here in the future! What a great family vacation destination! The view from the room is fantastic (I'm assuming that's where you took the pics?) The kids would just love the slime!